As predicted in last weeks newsletter, Sunday afternoon was definitely the time to be out kite fishing on the west coast. Paul and I took a trip out to Muriwai Beach to check out all the catches and take some photos. We expected dozens of kite fishers would be out taking advantage of the ideal conditions and late afternoon falling tide. To our amazement there were only a hand full of kite fishers on the beach. From the creek at the Golf Road entrance right up to the beginning of the cliffs, there were only around 7 or 8 kite fishers on the beach at around 3:30 pm. The winds were light during most of the day, around 10 knots, but got up to 15 knots or more of north east as we arrived. A moderate rip was running up the beach, the surf was fairly low for the west coast and the conditions were overcast. You couldn't ask for better kite fishing conditions. Lloyd and J. Li were running a dropper rig with 10 hooks using frozen mullet bait. On their first set they let the gear fish for one hour and managed 2 nice sized snapper. On our way back down the beach an hour or so later they were just pulling in their second set as the sun was going down. They caught another 2 snapper up to 2.5kgs, slightly larger than the first two. 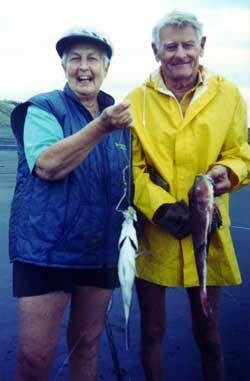 Stan and his wife have been kite fishing for around 14 years now and regularly fish Muriwai and Dargaville. Fishing a bottom longline rig, with around 15 traces attached, they caught a snapper and one very large gurnard. Due to the light winds they decided to under weight the bottle in order to get the gear out faster, and with the gear setting at a good speed, they attached their traces about 20 metres behind the bottle. Stan and Jenny were using triangle type clips on their traces and one very small weight in front of the hooks. It looked to us as though the mainline was lifting off the bottom once the gear was set. In fact, on several occasions, we could clearly see that the bottle was flying about 30 metres in the air. Most of their traces returned to the beach completely wrapped around the mainline. This is another sure sign the mainline was lifting off the bottom. Still they managed to catch a couple of fish on the traces closest to the beach. Paul and I were both sure that with a little more weight on the line, and in the bottle, and a 100 metres or so between the bottle and hooks they would have really cleaned up, the fish were there!! Mike was the last kite fisher we stopped to chat with on Muriwai. Mike fishes a bottom longline rig and generally only runs around 20 hooks because he fishes by himself. Due to the conditions on the day, Mike had also under weighted his mainline. With only a half a 2 litre bottle of water and one small weight on the hook section he too only managed to catch a couple of fish on the inside end of his gear. Mike fishes the west coast as much as possible and reckons the biggest snapper are off Muriwai in May and June. Mike caught a 10kg snapper from the top end of Muriwai during this time last year and says his best ever set was 16 snapper off 22 hooks set. The next kite fisher we came across was fishing a Pocket Sled Kite on 20kg line using a 9/0 Penn reel. His gear was around 300metres out. When we asked him how it was going he admitted it was a real struggle to get the gear out further in the light winds. We figured that the weight of the 20kg mainline and big hook section he was using was a much greater load than the pocket sled is designed to pull. Pocket Sleds are only designed for 10 to 15kg lines while towing 3 to 5 hooks out. Besides the obvious solution of using a Flexiwing Kite on this rig, doing away with the float bottle completely and using a rolling weight in front of the hook section would reduce the drag on the gear. This is because the rolling weight creates little or no extra drag on the line and will travel out much easier than other line weights or float bottles in light winds. Another option is to reduce the number of hooks set. Unfortunately this fisher had packed up and gone home by the time we came back down the beach so we don't know how he got on. Keith and Anna were fishing their Flexiwing Rig with the Flexiwing Skyhook attached. 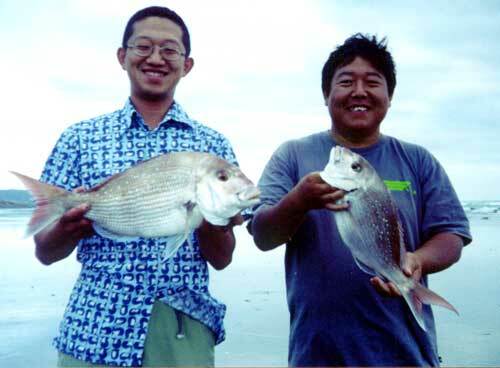 They set 10 hooks for 1 snapper and 1 kahawai. Keith reported that they had been out on the Saturday as well and caught 1 large stingray, 1 kahawai and 2 snapper around 1.5kgs each. With even lighter winds on the Saturday they used the Flexiwing Kite and Skyhook and then around 500 metres back on the mainline attached a Large Pocket Sled which Keith said "worked brilliantly for holding the line out of the surf." Keith and Anna were using fresh mullet bait and a combination of normal Target Snapper Hooks and the new Floating Bead Traces. 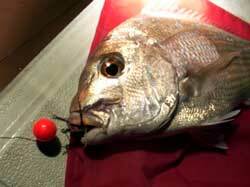 Keith commented, "We love the floating beads because they generally catch the bigger snapper". Keith's final comment before we moved on up the beach was "it's been a good day!" The majority of kite fishers we saw on Muriwai on Sunday had made the common mistake of under estimating the wind and under weighting their gear. While the winds appeared to be quite light on the beach, once the kites were around 300 metres offshore they caught the full strength of the wind which was around 15 knots and rising. Several of the kite fishers using longline rigs would have been able to increase the pull and obtain much straighter sets offshore if they had used a Skyhook in conjunction with their Super Kite or Nighthawk Kites. Rolling weights are invaluable in light wind conditions. Other weights can get bogged in the sand if the gear stops moving out and it takes an extra strong gust of wind to dislodge them and get the gear moving again. Rolling weights glide easily over sandy bottom types and provide the weight required to keep the gear on the bottom while reducing drag. If you fish a longline system which uses the triangle type clips, it is imperative that the gear remains hard on the bottom to help avoid tangled traces. The best way of increasing your catch rate, reducing drag, and increasing your setting speed with triangle clips is to allow the kites to tow the bottle 150 to 200 metres offshore before putting on your mainline weights and traces. This will keep the traces on the bottom and stop them twisting around the mainline. This also allows the kites to be in the full force of the wind where the extra pull of the kites will be better able to tow out the terminal tackle through the surf and inshore rip. A fishing report just passed on from Rob at our Onehunga shop, a kite fisher landed a fantastic 10.1kg snapper just last weekend at Kariotahi Beach. Sorry, no further details were supplied. I had an evening fish on Saturday. Only a couple of snapper and one large lemonfish to report. The snapper shown was on a Target Hook with red flasher snelled in. Actually darkness fell and I had a job finding my setline, I will attach a cycle lamp to the flag next time. Neville and Maeve King on the 21st February were fishing Orewa and caught 5 Snapper, the biggest being 2Kg using salted mullet for bait. 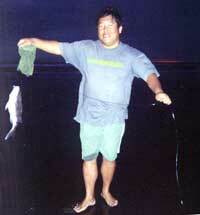 David Billings caught 5 Snapper, 5 Gurnard, 1 Kahawai, and Sharks using mullet for bait. Neville and Maeve King caught the biggest snapper for the month and they win a silver pin for their 2kg Snapper. The Club Day was cancelled due to light winds in the wrong direction the first week, and unpredictable winds the second week. The Club Day is held monthly on the Sunday after the Club Meeting. This is dependant on wind conditions being favourable. Whether or not the Club Day is held, and if so, where and when the weigh-in will be, is posted on the Radio 1ZB cancellation service on Sunday morning. As this service is not entirely reliable, the same information is available on a telephone-answering message from Saturday night at 8pm onward. The phone number is (09) 827-2429. (N.B. this answer-phone service is only available on the same weekend as the Club Day). Robbie Cullen was fishing at Dargaville with David Billings on the last day of February. 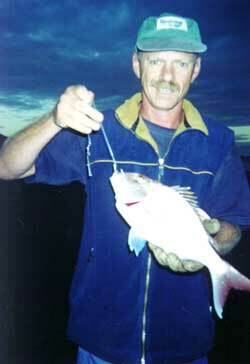 With high surf and at about midday, he caught a 35cm Trevally, a small Snapper and a XOS Stingray. David did O.K. Tony Talbot fell off his chilly-bin at Te Arai Point as he was trying to get a better look at naked women on the beach. Whether he was there kite fishing or bird watching remains unanswered. There was no catch report entered by Tony last month.